Howdy everyone! It's time for a new challenge – no foolin'! 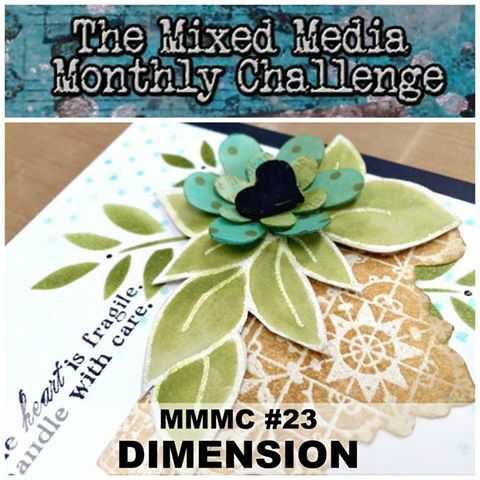 This month we want to see dimension in your projects! 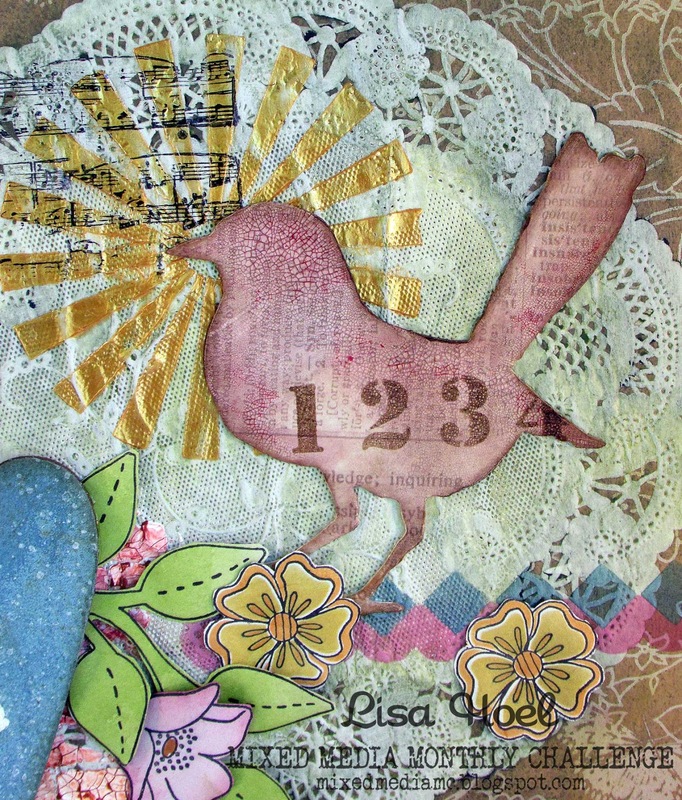 We also have a special guest designer with us this time – the fabulous Wendy Vecchi!! Stampers Anonymous has donated two of Wendy's stamp sets and stencils to be given away to two lucky winners. Be sure to join in the challenge for a chance to win. I created an "ode to Wendy" for my project. ;-) (Another ATC binder – seriously! I still need another one too LOL.) 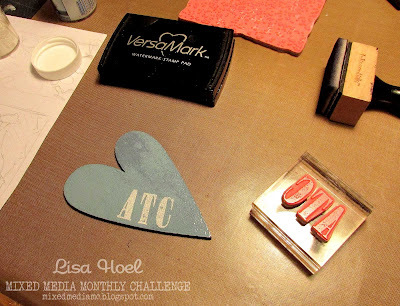 I pulled out all my Wendy stamps, stencils, inks, pastes, and the rest and went to town. I think I qualify as a fan; I have a lot of her stuff! 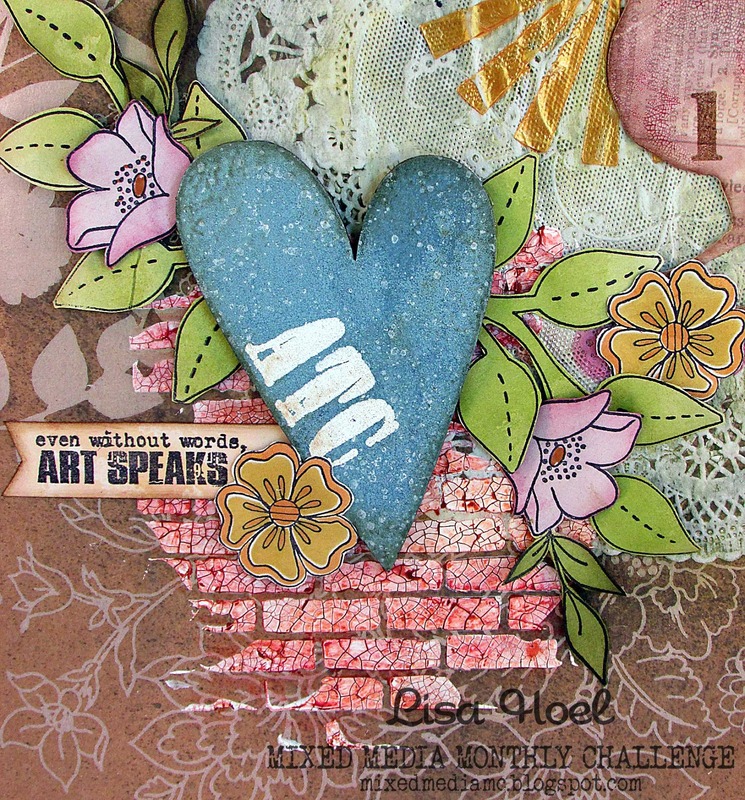 Yes, I know – another ATC binder. My collection keeps growing! 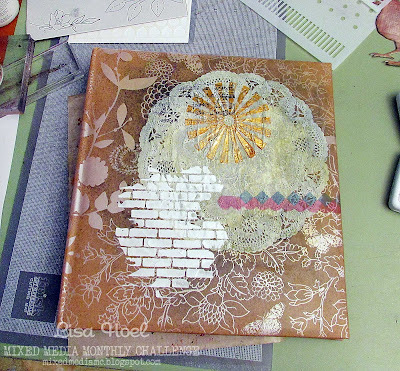 I started out by prepping the binder cover with a coat of Matte Distress Collage Medium and also glued the paper doily on with it (topping the doily with another coat as well). I colored it with Distress Crayons by scribbling a bit of color onto the doily, working it into the crevices, and then blending it with my finger and a touch of water. I also added stencil details using metallic paste and crackle paste. 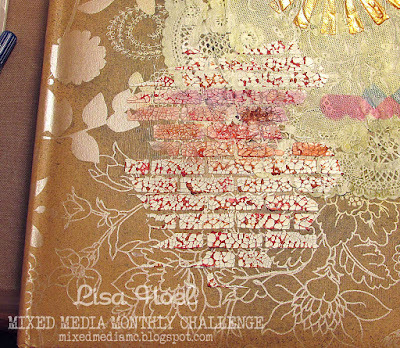 Here you can see how I scribbled a bit of Distress Crayon onto the dry crackle texture paste. A little color goes a long way! I dipped my finger into water and then used it to blend the crayon. I like how it worked its way into the cracks. All the flowers were stamped onto Wendy's newsprint paper that I had glued to Clearly for Art plastic and then fussy cut out. Clearly for Art is magical stuff! 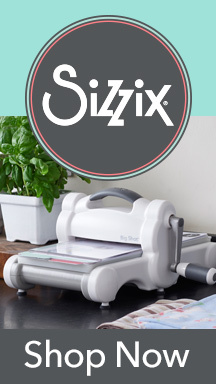 It is a heat sensitive material that gets soft when you heat it with your embossing gun so you can form it into different shapes. It quickly cools and holds the shape! Don't like it? Heat it again and reform it! It is great for creating dimension. I gave all the flowers and leaves a bit of curl so they would pop off the cover. 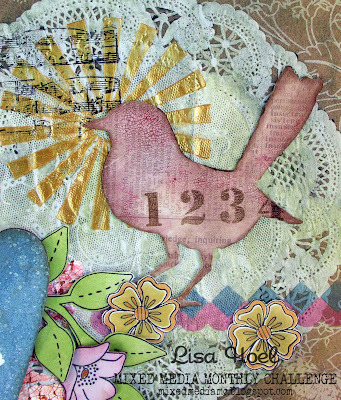 The bird is covered with Crazing Distress Collage Medium. It gives the surface a subtle crackle effect. 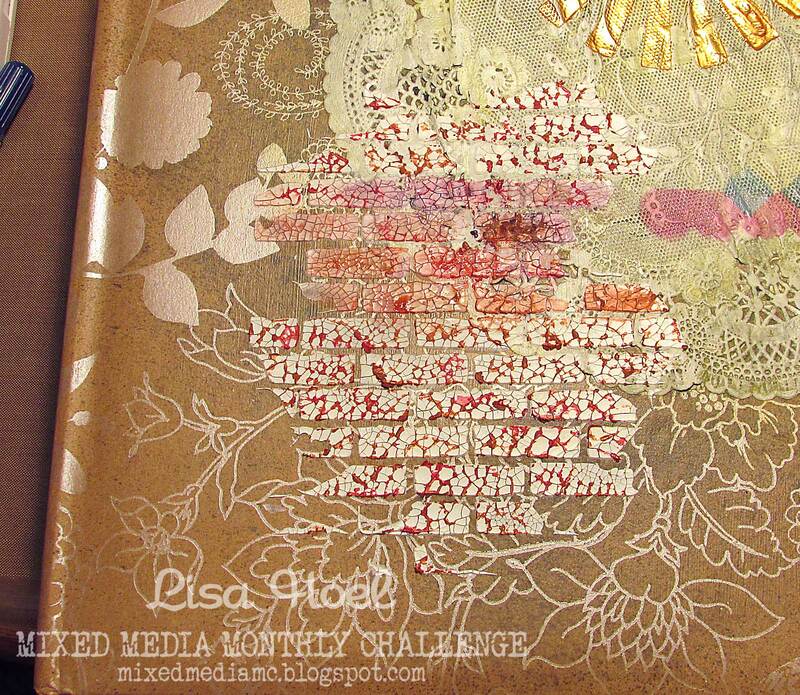 I rubbed Distress Ink and Distress Crayon into the surface to bring out the crazed pattern. Many thanks to Stampers Anonymous for donating to our challenge! Lovely spring canvas! Beautiful layers and textures!! Wonderful mixed media piece, love it!! "Ode to Wendy"...love it! :) I bet she loved it, too. I like the way the crayon looks on the crackle- how awesome! wow! Such eye candy! I'm a sucker for a doily and this one is part of an amazing arrangement…love it! This is an awesome piece or art! Nice colors and textures too. What an awesome "ode to Wendy"... yep, with all that product I think you qualify as a fan! Thanks for sharing which techniques you used, I think I'd like to try the graniteware technique. Beautiful project. Love the layers and dimension! really pretty!!! I need to figure out how to store my ATC cards...this is a really pretty storage solution! enjoyed the step by step pics and the final creation is truly pretty! This is super sweet! I have the bird die and have been waiting for inspiration. Thank you for giving me a bit of yours. TFS! Lovely texture and super nice colours, super!!! 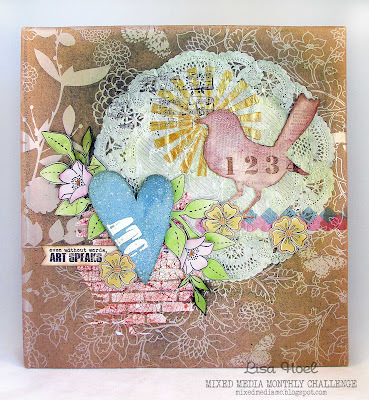 Fabulous layers of texture and stamping creating real depth and dimension - this is wonderful. This is pure joy! I Love the layers and the femininity of this project! So pretty! Amazing work!!! Thank you for putting so much work and effort into this challenge inspiration! Great cover - love it! I love all the rich layering of textures in your beautiful book cover design. The color scheme is fantastic too. Blessings! Absolutely gorgeous Lisa. Love how you used so many things to create such great textures. Thanks for sharing your process as well. Sweet colours, beautiful layers, great canvas!